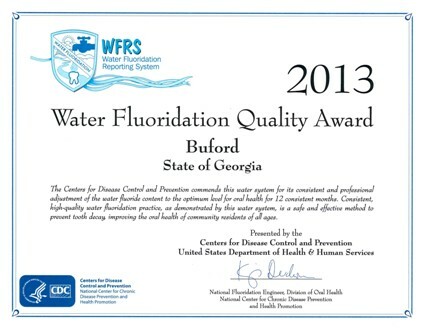 The City of Buford receives its water from Lake Sidney Lanier, located just north of Buford. We also purchase a portion of our water from the Gwinnett County Water Plant. Lake Lanier is very low in point source and urban runoff pollutants. The Buford Waterworks was built in 1934 to filter 500,000 gallons of drinking water per day. In 1965, it was increased to 1 million gallons per day. In 1994, the plant was high rated to 2 million gallons per day. We plan to grow with the future needs of our citizens. 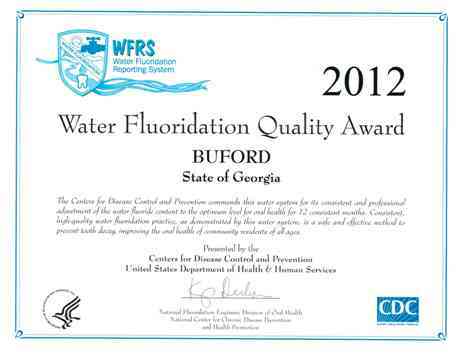 Please contact Customer Service at the City of Buford (678-889-4600) with questions concerning the Water Department. How Water-Smart is Your Household? How Water-Smart is Your Business/Industry? 2. Run your washing machine and dishwasher only when they are full and you could save 1000 gallons a month. 3. Use the garbage disposal sparingly, compost instead and save gallons every time. 4. Keep a pitcher of water in the refrigerator instead of running the tap for cold drinks, so that every drop goes down you not the drain. 5. If your shower can fill a one-gallon bucket in less than 20 sconds, then replace it with a water-efficient showerhead. 6. Time your shower to keep it under 5 minutes. You'll save up to 1000 gallons a month.